Cause and Effect: Match Them! It’s important to know the cause and effect of different things! Sometimes it can be difficult to tell what they are. Here is a free worksheet to print out for your students to match the cause and effect in the given examples. 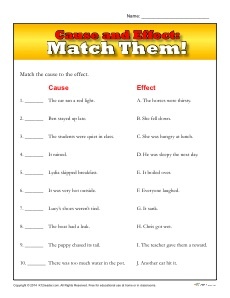 This cause and effect worksheet is great for 3rd and 4th grade, but can be used for other grades as appropriate.